Bike racers want their numbers to lay flat and not flap in the wind. They think that crumpling their number helps this. Let me give you the secret: 8 pins. Not 4 pins (and absolutely not 4 pins using the provided holes—this is cycling, not sailing club), not even 6. You get a handful of pins at nearly every race. Save a few. Then don't be lazy, don't whine, use 8 and this entire official/racer argument goes away, save the lazy bike racer. But of course, bike racers are (by definition, I believe) lazy. So we have a problem. For officials, seeing the numbers on riders whizzing by 5 deep at 25+ mph is an exercise in futility. A single line at 30 mph is no better, but this is the job of the official. Some officials are lazy, too (former racers? ), and don't actually try to read all the numbers every lap, so they don't care how numbers are pinned. These officials should be stoned—they are the ones that take a millennium to figure out results because they have no practice at picking out 10 places in order at the finish. But most officials do care and spend the entirety of a race trying to decipher the perspective-bending Dali-esque attachments racers manage to make with their numbers. For them, crumpled numbers are the emblem of their nearly-futile task, not the cause of it. Sure, the stickler quotes the rule book, but one of the jobs of an official is educating riders. Aside from the occasional power trip, it's just part of the job. So we have lazy bike racers and officials who've found a scapegoat for the nearly impossible task of reading thousands of numbers during a day. The reality is that the rule is stupid for three reasons. First, like all other riders, I pin on my number, warm up, go to the bathroom, sit down, load and unload my rear pockets multiple times, and perform numerous other actions that WILL crumple my number whether or not I did it intentionally. Second, the Tyvek material used for numbers reflects sunlight pretty well if you get the right angle. A poorly crumpled number (intentionally or incidentally) will probably have a few surfaces that reflect light and reduce the visibility of the number. However, a pristine number can reflect light across its entire surface rendering it completely illegible. That all points to the fact that you need to learn how to put on a number like a pro. When you crumple the number, don't just wad it up and be done. You need to decimate it! So get comfy and start crumpling. And rolling. And flexing. Now repeat. Finally, find a nice edge and smooth it all out. Hey, don't rip it—that's way amateur. But when you're done, the thing should feel like silk and lay on your jersey like your head on a 600 thread-count Egyptian cotton pillowcase. Once you take the pro approach the officials won't notice a thing but the high resolution outline of your number. Unless it's upside down. Or on your back. Or flapping like a sail from 4 pins poked through the 4 dummy holes. So just use 8 pins, put it on your side, and get the race started already. It's common to see riders standing when they are riding, whether it's going up a hill, accelerating, or stretching out. But if your goal is conserve as much energy as possible, it's also good to know to that your heart rate will usually increase when standing, even when putting out the same power. This graph from a recent ride caught my attention because it shows this tend very clearly. HR increases slightly while power, speed, and cadence all decrease noticeably during each of the three periods of standing. 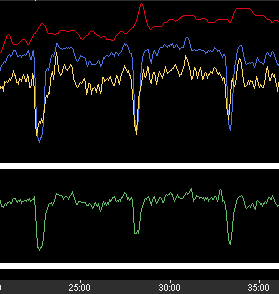 This graph is from a roller ride so the conditions are different with regard to speed and power change; speed and power wouldn't decline like this on the road, but I like to remain on the rollers so this naturally what happens when I'm stretching out. While the increase in HR is small, it's still noticeable and all the more telling since power declines. The reason for this increase in HR is that you are activating additional muscles to do work, and a rise in HR can be expected when recruiting additional muscles to do work. But similarly, it means that you're using additional energy to supply these newly working muscles that aren't necessarily putting more power in the pedals. So keep in mind: when max power is the goal, standing may be your friend. But when it's time to conserve energy, seated is the way to go. Dan Currell and the crew at the National Sports Center Velodrome in Blaine, Minnesota put together a great guide for riders interested in trying out racing on the track. The guide is really designed for riders familiar with riding the road, but who need to know the differences and subtleties that will make learning to ride on the track a successful transition. It covers differences of riding a road bike versus a track bike, the markings on the track, some basic rules of the “road” when racing on the track, equipment, gearing, leg speed, events, and more. If you're interested—or simply curious—about racing on the track, it's definitely worth a read. Author and coach Joe Friel has a great post over on TrainingPeaks.com addressing the often overlooked racing topic of patience. Road racing is not a sport of simply going harder the next guy. If you're looking for that try mountain biking or time trialing. But if you toe the line at a crit or a road race, it's good to understand that when you expend energy is very important to your success. The article talks about this in reference to a stage race, but the principle applies whether you're racing Le Tour or trying to make it to the end of the group ride for the first time. If you’ve learned how to change a tube, then you know about tire levers. They’re small and get the job done, but I don’t know anyone who likes them. You fight to get a grip with one, then fight to get the tire where it needs to go. If you’re trying to mount a tire that is especially tight, this can be a long, finger numbing battle ... one that I haven’t always won, and I bring a good amount of skill and experience to the process. I happened to run across a comment about a tire jack tool. I wasn’t sure exactly what it was referring to but with some quick digging I found it! The Kool-Stop Tire Bead Jack might not replace your set of tire irons on the road—although, it’s small enough that it’s possible—but it’s a dream for your toolbox to use at home or out of your car. Anyone who’s changed a tire knows that slippage on the tire and/or rim while using tire levers is just part of the trial and error process of mounting a tire. No longer! The Tire Bead Jack provides a secure hold of the tire and a very secure fulcrum point for lifting the tire onto the rim. At about $12, it’s not expensive. You might not use it every day, but if you plan to keep riding your bike, you’ll probably see how a tool like this would be a great asset to avoid those tire mounting struggles.